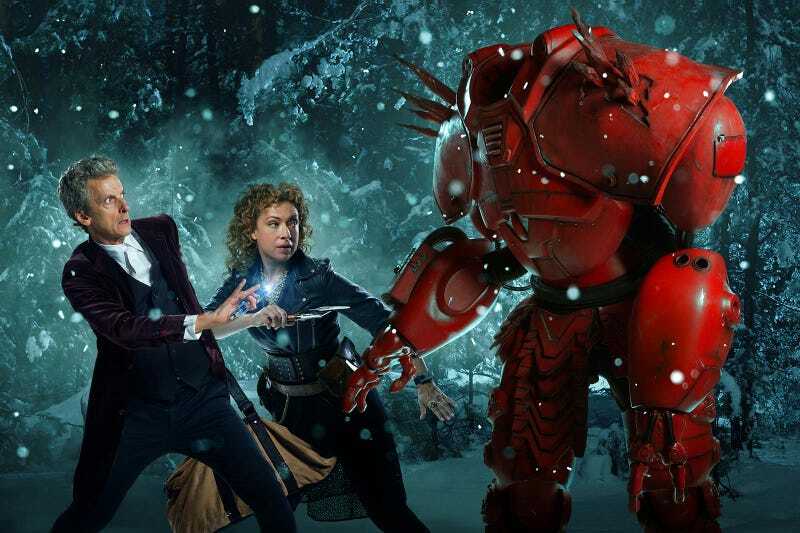 This Week's TV: River Song and the Doctor Fight a Robot Crab at Christmas! River Song returns in a new Doctor Who Christmas Special! There are 96 hours of Godzilla on El Rey! Lucy Lawless finally returns to Ash vs. Evil Dead! Happy Holidays, it’s This Week’s TV! Have they tried Hare Krishna? Behind-the scenes look at the new Damon Lindelof/Carlton Cuse joint, premiering next month on USA. Or watch it on Youtube. The Muppet Movie! Treasure Island! Great Muppet Caper! And, uh, Letters to Santa— Uma Thurman’s in it as an airline ticket salesperson, for some reason. Merry Christmas, it’s an eight-year old girl suffering from Loa loa filariasis! Check out the live stream. This show continues to be the most amazing miracle—and even though the first four episodes were already released online, we’re still watching this on our big TV screen, because there’s so much pretty. A good one—also airing at 5PM on Christmas Day. Yep. They made an animated TV series out of that movie that had beautiful creature animation and a dreadful story. Hope there’s more of the former and less of the latter. 96 hours of Godzilla movies!!! No Biollante, Hedorah or Ebirah this year, but there’s Megaguirus, Destroyah, and Rodan in his own amazing film! Check the schedule for times. Definitely an inferior film to Syfy’s Abominable, but you can’t deny that it’s more Christmassy. The episode that really upset Matt Smith at Alex Kingston’s wedding! You can watch it in a theater if you’re in Denmark. Season two comes to Netflix! Ten mega evolutions promised. Also, Zygarde. Eric Roberts as a spooky heart surgeon! Ash vs. Evil Ash, 2015! And Lucy Lawless returns, FINALLY! God Told Me to & It’s Alive! Two incredible movies—the whole It’s Alive series is ripe for analysis. Start your love affair with the films of Larry Cohen, today.